I'm with you on the jewel tones - especially Emerald, my favorite! I'd absolutely love to win tickets to the event! I'm most excited about layers and I would love to come!! Thanks for the shout out for our big event! I went last year but we're going to be in the mountains this year since it's a holiday weekend! I've been wanting to attend this event! I'm most excited about booties- I bought some last year but kept getting nervous to wear them. Now I feel like I can pull them off!! Definitely with you on the jewel tones! Royal blue & emerald-- especially! I'm also excited for fur, booties, & pulling out all my fun scarves. I would love to go! I'm most excited about all the fun fall colors, big sweaters and boots! I love all the fall fashions trends this year from: emerald jewel tones, wearing white, wild jackets, classic prints, military, etc. My favorite is all the leather. It can be dressed up or down while still being edgy, classic and chic. Would love to attend with my roommate! 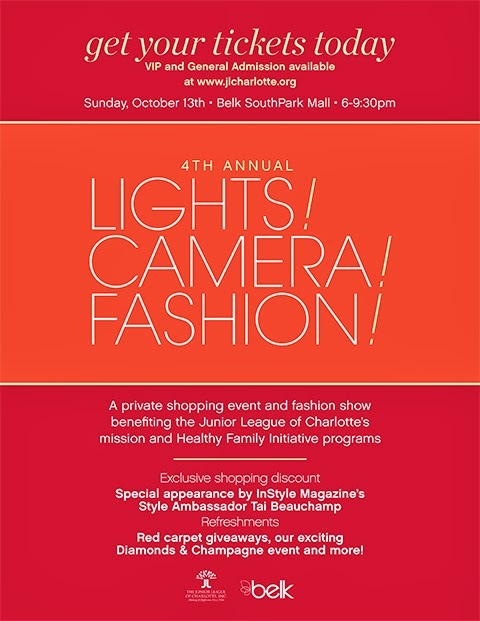 We love Charlotte and especially Belk. Excited about everything fall...boots, animal prints, rich fall colors! Yay fall fashion! Wow, how do I choose? :) I'm really excited about touches of vegan leather. I would love to attend this event! What an awesome event, I'd love to you! I think my favorite fall trend is a tossup between the military inspired trends, and leather clothes and accessories! Oh, yay. I am looking forward to deep burgundy lipsticks and blue accessories. I am looking forward to vests - just ordered an amazing one from Old Navy this morning! I'm most excited about boots and COLOR!